A Palestinian Arab identified as being from Jerusalem this afternoon plowed the car he was driving, a white Mazda sedan, into a crowd of commuters at a cluster of bus stops near the city's Central Bus Station and a hundred meters from the landmark Bridge of Chords at Jerusalem's main entrance. It's reported that fourteen people are injured in this latest in a lengthy string of Arab-on-Israeli vehicle-ramming terror attacks, almost all them (like today's) directed specifically at civilians. This afternoon's Jerusalem victims include a toddler of 15 months, and a female in her seventies. Three victims are described as suffering moderate injuries; the injuries of the remainder are said to be light. The attacker, Abed el-Muhsen Hassuna [عبد المحسن حسونة], was 21 years old, and lived in the Beit Hanina neighbourhood of north Jerusalem. (Haaretz transliterates his name as Abed Almohsin Hassoneh.) Acting quickly in the spirit of these difficult, terror-infected times, and in accordance with orders that have wide support in this beleagured country, security personnel stationed nearby, as well as at least one armed civilian, shot him dead as he tried to exit the car. Not so incidentally: a young woman with the same surname was killed by fast-reacting IDF shooters two weeks ago ["01-Dec-15: Tuesday's Arab-on-Israeli violence continued"] at a checkpoint next to the Einav community in the Samaria district. She was stopped in the act of carrying out a terror attack against Israelis. Times of Israel named her at the time as Maram Ramiz Hassouna, aged just 19, from Nablus. It's possible security cameras will have captured the attack which happened at the start of the afternoon rush hour, around 3:00 pm. For now, we know this, that Hassuna drove his car at high speed and very deliberately onto the sidewalk, smashing into pedestrians at one of several side-by-side bus stops on busy Herzl Boulevard just before the point where it meets the Central Bus Station and beside the city's International Conference Center (known locally as Binyanei Ha'uma). The attack car smashed a fire hydrant, sending a plume of water shooting into the air. 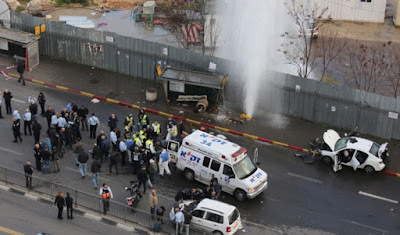 "Palestinian shot dead, 11 injured in Jerusalem car ramming attack" [Ma'an, December 14, 2015]. PLO Central Council member Muhammad Eshteyyah in a press conference last week said that 85 percent of Palestinian deaths to take place since Oct. 1 could have been prevented if the [Israeli] “shoot-to-kill” policy was not implemented. Ma'an's highly ideological editors however are characteristically silent about how many lives might have been saved on both the attacker side and the victim side if the murder-lusting Palestinian Authority leadership discontinued its practice of praising the rammers, shooters and stabbers and stopped elevating them to "martyr" status. The family and connections of Abed el-Muhsen Hassuna can be confident tonight that, as we write these lines, his promotion to the Palestinian Arab Hall of Fame is assured. If we see some of the expected wall posters praising his "bravery" and "national achievement", we will add them here. UPDATE Tuesday December 15, 2015: The Jerusalem Post, quoting an un-named official source this morning, says the efforts to save the leg of the hospitalized fifteen month old victim we mentioned above have failed. And Hamas has claimed the attacker as one of theirs. The martyr posters are already up.